Epilim, with a generic name of valproate sodium or sodium valproate, is an anti-convulsant drug derived from valproic acid used in several neurologic conditions. Sodium valproate is the salt form of valproic acid. Epilim is available in enteric coated tablets, crushable tablets, and syrup and injection preparations. Sodium valproate acts by stabilizing the electrical impulses to the brain to prevent over stimulation of the central nervous system. This results in improving the brain activity and preventing too much firing of nerve impulses. The over stimulation and excessive nerve impulse transmission often results to seizures. In addition, Epilim also enhances the release of GABA. GABA or gamma-amino-butyric acid is an inhibitory neurotransmitter responsible for calming the individual and stabilizing the brain function. In addition, the drug also inhibits sodium from entering the nerves which prevents excessive nerve impulse transmission. Sodium is responsible for initiating an electrical impulse in neurons. Epilim is used for various conditions, but has more Epilim side-effects than other anti-epileptics, which makes the drug second-line treatment for epilepsy and seizures. This involves the lowering of platelets, RBCS and WBCs as a result of interfering with the bone marrow activity. These Epilim side-effects should be monitored and prompt treatment is needed. The patient may receive blood transfusions to correct the problem. In addition, the patient should also be careful to prevent easy bruising and infection. The presence of GABA increases the general well-being of clients, which improves appetite. Weight gaining may be managed through exercise and proper diet. The action of Epilim on cells also affects the hair follicles which results in hair loss. This is temporary although the re-growth may be curly in nature. Hair loss may be treated with hair growth products or herbal remedies such as Aloe Vera. The excessive inhibition of sodium in the neurons may lead to slowing of the brain conduction that leads to drowsiness as Epilim side-effects. Caregivers should ensure safety to prevent accidental falls especially among pediatric clients. Confusion may also be experienced because of slowing of nerve impulse transmission. Management includes orienting the person to time, place and person. Overdose of sodium valproate may lead to depression because of excessive inhibition of nerve impulse transmission. Correct dosing and administration should be employed to prevent this Epilim side-effect. Skin rashes appear as a sign of allergy to valproic acid. Stopping the medication is the first action with the administration of antihistamines to relieve allergic reactions. These Epilim side-effects are a result of withdrawal symptoms from the drug. To prevent these, the dose should be tapered accordingly. These gastrointestinal Epilim side-effects are a result of drug overdose which makes the body act to eliminate the drug. These Epilim side-effects may be prevented by correct dosing. 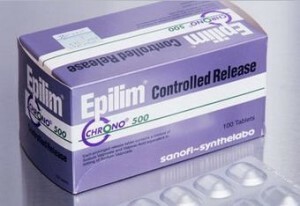 Epilim use is still beneficial to people with epilepsy, despite the Epilim side-effects, especially those who only respond to this drug. The Epilim side-effects can be managed and prevented while using sodium valproate so patients should not be alarmed in using Epilim if this will save the lives of those having epilectic episodes. Women who want to be pregnant should also inform their physicians in order to adjust the dosage and give folic acid to prevent neural tube defects on the fetus as Epilim side-effects.